Fills the rapidly-growing need for hands-on guidance in resolving interpersonal disputes in all areas of life--including the workplace, the classroom, and courtroom-adjunct programs--offering a how-to approach to mediation. This book is a valuable tool for the growing group of lay and professional mediators, including volunteers and professionals in court-adjunct programs, attorneys, teachers, and social services, along with HR professionals and managers in organizations who need these core skills areas for their work. 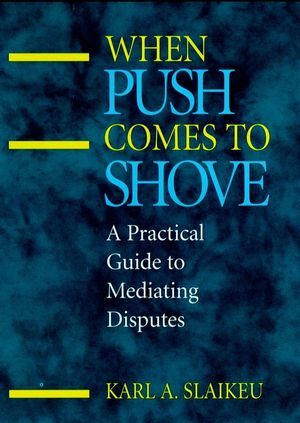 When Push Comes to Shove covers the basic interpersonal and communications skills needed to mediate conflict, presenting a five-step mediation process, and coaches the reader through each phase. It also addresses mediation on the fly where a more structured process is not possible or called for. KARL A. SLAIKEU is president of Chorda Conflict Management, Inc., an Austin, Texas based consulting and training company specializing in conflict management systems and training. His previous books include Crisis Intervention: A Handbook for Practice and Research (1990, 2nd ed.) and Up from the Ashes: How to Survive and Grow Through Personal Crisis (1987).